In-Fisherman Freshwater Trophies blends realistic graphics with expertise from the editors of In-Fisherman magazine to give you the most authentic freshwater fishing experience ever created! Cruise the lake, cast in your line and watch as a perfectly modeled, animation-blended bass grabs your lure. In Fisherman Freshwater Trophies A good basic game on fishing.Good quality graphics.Not much difference between experience levels.Is helpful for a novice or beginner in teaching about the basics of fishing.Excellent game for children who are interested in learning to fish.More options for things such as rigging, and techniques would have made it much more realistic and challenging for the experienced fisherman.For example the use of weights is absent.And even though there are no weights associated with any of the plastics they drop to the bottom very quickly and stay close to bottom the whole time.It’s a fun but very basic game. Good Fishing Game In-Fisherman is a great fishing game. I like the underwater camera that can make several view shots including following the lure or panning 360 degrees. The graphics, such as the sky, land and water are very good and I actually like it better than any other fishing game I have played. The boats and such are ok but not what I would call excellent, especially when you are moving around in water, it just looks fake. The live worms are a real neat feature. The tackle box is skimpy so don’t plan on using a lot of different baits with this game. I didn’t like how you had to set the hook and you only had a couple of seconds to do it or the fish was gone. It would set sometimes but other times despite my best to move the mouse, the fish would take off. The casting is easy. Getting around is easy using the map. 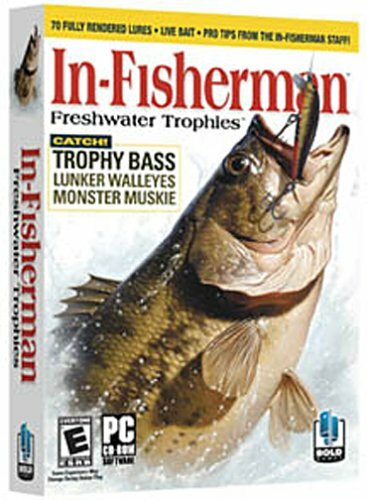 Overall a great fishing game but not for anyone looking for a big tackle box. I like the fact that I can catch a lot of variety of fish though so that makes up for the lack of tackle. Good value for a fishing game This game isn’t very demanding of your computer, which means you’ll have no trouble running it on anything made since 1998, more than likely. The best part of the game is outsmarting the fish, which is enjoyable for longer than I thought it would be.My 11-year old son played this for hours at a time, funny enough. We’d hear his shouts as he pulled in another fish bigger than the last.Easy to play, not amazing visually, but effective enough to be fun.